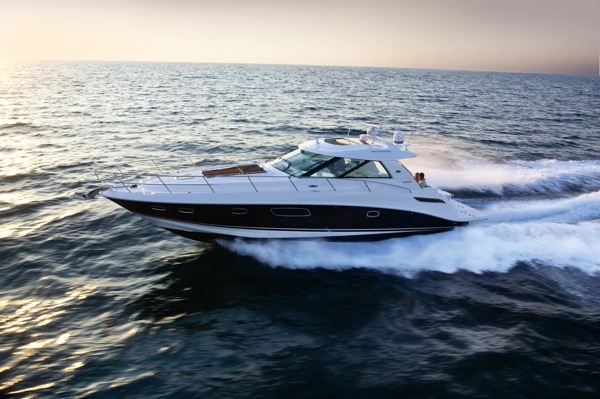 Sea Ray has introduced 14 new models in the past two years alone. This explains how the world’s most respected boat builder stays on top, by keeping its fleet constantly evolving and improving. It also explains why boat buyers repeatedly turn to Sea Ray for the latest technologies and freshest designs in the industry. Naturally, the all-new 450 Sundancer® advances Sea Ray’s tradition of forward thinking with innovative and trend-setting features like its standard Axius® propulsion system with joystick control, a fiberglass hardtop with retractable sunroof, a cockpit entertainment center with optional grill and TV, and a designated “media room” in the cabin. Add all these things together, and you could have the most adaptable, user-friendly express cruiser on the water. Starting topside, the 450 builds upon the versatility of its Sundancer siblings with a seamless hardtop and bonded-in windshield that provide unsurpassed climate control thanks to a forward vent, sunroof, and optional cockpit air conditioning/heating. The benefit is comfortable boating in all kinds of weather. Two, doublewide benches with flip-up bolsters and armrests serve the helm and port console. 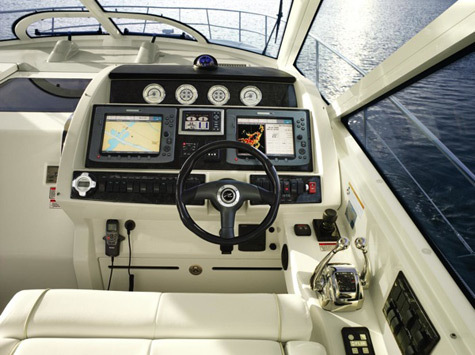 The helm itself comes with a full complement of driving and navigation aids to make operation easier than ever, from the SmartCraft® VesselView display, to the Axius or Zeus joystick control, to the amazing Skyhook® station-keeping feature. Twin diesel Zeus® pod drives are also available either with the QSB 380’s or the QSB 480’s, allowing customers to personalize their power depending on how and where they boat. Leisure possibilities abound at the large, U-shaped cockpit lounge with removable table. The aft-most backrest of this seat is split, and the two sections pivot open to create an extension of the sun pad, which has abundant storage below for lines, fenders, and other necessary items. 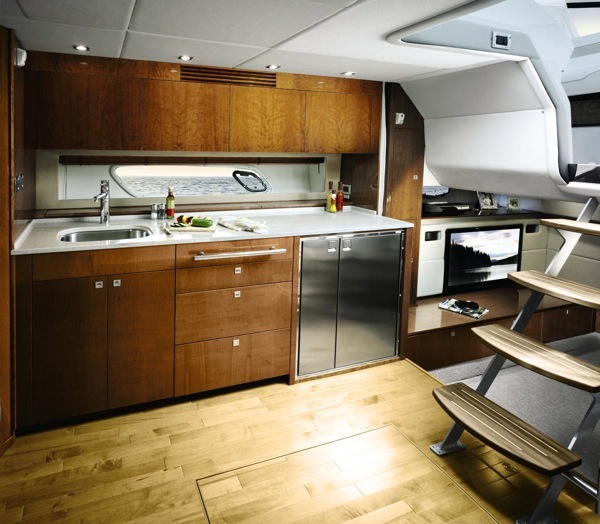 On the starboard side of the cockpit, a big, L-shaped wet bar with icemaker will keep everyone hydrated, and owners can choose to add an optional grill, refrigerator, and removable 19″ flatscreen TV to create an “outdoor galley” atmosphere. 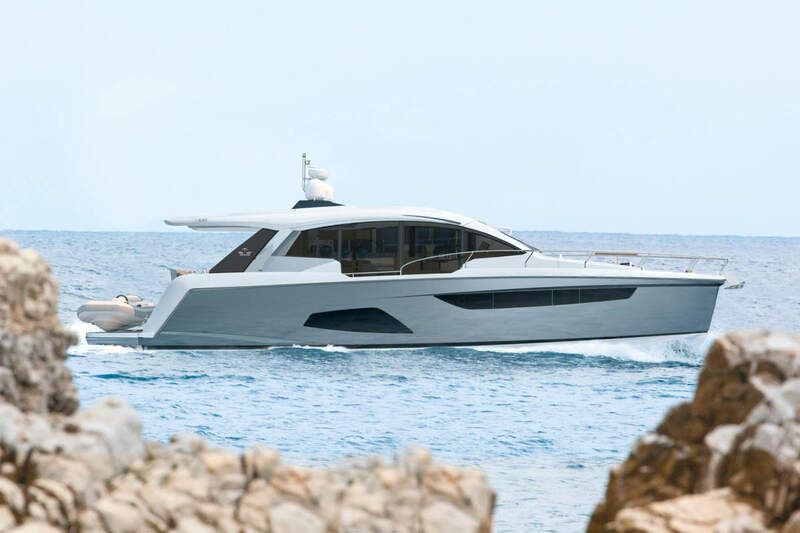 Under the sleek exterior of the 450 lies a classic-contemporary interior, with top-of-the-line cabinetry from Sea Ray’s Cape Canaveral Woodworking & Finishing Facility, Ultraleather seating, brushed chrome accents, and optional wood floors. Ambient light from the oversized hull windows and skylight gives a natural glow to the earthy materials used in the cabin. The forward stateroom features a full-size island V-berth with memory foam mattress and electric extension and Posturepedic® backrest, plus a Shoji-style sliding door and separate head and shower compartments with tile floors. The main cabin houses a spacious galley with stainless-steel appliances and loads of storage along the port side; to starboard, a dining area with folding table easily coverts to a sleeper. The Sony® stereo located here comes fully outfitted with an iPod® docking station, CD player, Sirius® satellite receiver, amplifier, subwoofer, and more. 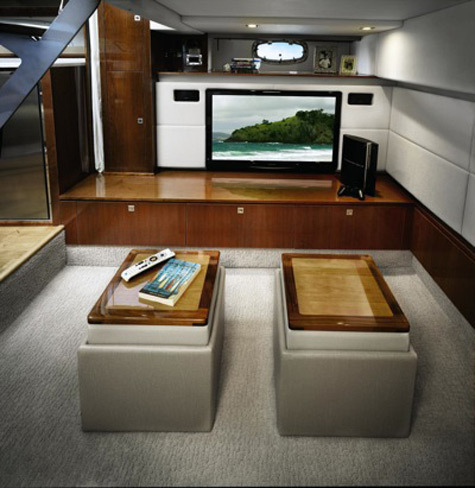 At the heart of its entertainment-ready interior, the new 450 features a unique media room abaft the salon that comes complete with theater seats, accent lights, and an entertainment system boasting a gaming system port, MP3 port, DVD player, and a 32-inch TV. If it’s true surround-sound feel you’re looking for and a large-screen experience, select the optional entertainment package that offers the Bose 3-2-1 System and 37-inch flatscreen. Those two options will surely keep any child or adult happy. A pair of ottomans serve double duty. These ottomans not only have storage inside, but the tops are reversible – one side has a wooden tabletop; the other is cushioned. You can either place your drinks and snacks on the table side, or flip it over and throw up your feet and relax! (There are also hanging lockers to port and starboard, as well as a storage cabinet). 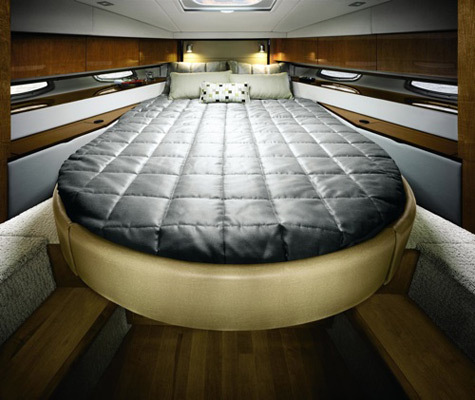 The theater seats convert to a double berth by way of their slide-out base, and a curtain provides nighttime privacy. A long list of options allows the owner to rig the new 450 Sundancer with advanced electronics, generators, teak exterior decking, a foredeck sun pad, hydraulic-lift swim platform, rod holders, and several choices of upgraded stereos and TVs throughout. Now that’s entertainment! Content and picture release courtesy of Sea Ray. 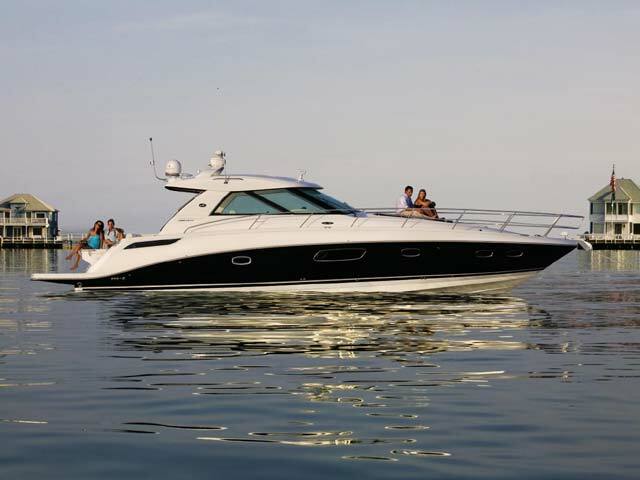 Nice info on the 450 Sundancer, Sea Ray have a great range and I had the chance to work on the larger Sea Ray cruisers in the US last year the 450 is a welcome addition to their 2010 line up. They are certainly and alternative to the European builders.